A famtrip delega tion comprised of 30 international travel agencies conducted a fact-finding tour of the central province of Thua Thien-Hue on September 20. The delegation, with its 47 members representing countries such as France, Italy, Russia, and the Republic of Korea, were invited by travel agencies like Saigontourist, Hanoitourist, Vietravel, and Ben Thanh Tourist. They surveyed tourism routes and joined a Gala Dinner organized by Thua Thien-Hue’s provincial People’s Committee. During their two-day stay, they will visit historical and natural relics, sample Hue’s cuisine, and participate in tourism fairs. Tour operators in Thua Thien-Hue welcomed local businesses to a seminar intended to encourage cooperation and explore partnership opportunities. 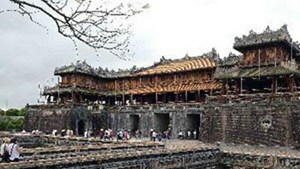 Provincial authorities introduced the Hue Festival 2014, the 2014 Golden Tourism Week, and the Hue Relics Preservation Centre’s attractions for foreigners. Thua Thien-Hue is commemorating 20 years of its Hue imperial relic complex recognised as a UNESCO world cultural heritage site, and 10 years of the Hue Royal Court music’s inclusion as intangible cultural heritage of humankind. The reopening of the upgraded Phu Bai International Airport on September 20 is expected to attract more tourists to the province.